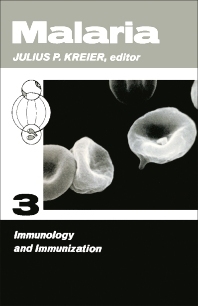 Malaria: Volume 3, Immunology and Immunization is a collection of papers dealing with malaria parasites, the methods for measuring the immunological response to plasmodia, and the vertebrates host's immune response to plasmodia. Some papers discuss immunization against sporozoites, against the exoerythrocytic stages of malaria parasites, against asexual blood-inhabiting stages of plasmodia, as well as gamete immunization in malaria. One paper describes various separation methods to isolate malaria parasites and their constituents. Another paper discusses in detail the theory and practice of methods used in measuring antibody responses which occur during plasmodial infections, including the antibody response against sporozoites, exoerythrocytic forms, and in the different blood stages. Another paper explains the vertebrate host's immune response to plasmodial infection as a homeostatic physiological response changing along with the progression of the disease. The changes in the dynamic cellular cascade are different as the disease progresses causing death, than when these lead to recovery. Another paper enumerates the parameters which determine malarial infectiousness from one individual to another such as the time of onset, duration, intensity of the blood infections, as well as the maturity, longevity, and rate of production of gametocytes. Pharmacologists, general medical practitioners, investigators, and laboratory technicians involved in malarial research will find the collection very useful.